You have a gorgeous photo or downloadable art print and are ready to DIY print at home on your printer. But after printing it, the colors printed look nothing like how they did on your screen, and your like, “whoa”, what happened? You really want it to look like the image shown on your screen. I totally understand, and it is the reason I created this informative tutorial, which covers tips for printing at home, and give you some background as to why those colors can look so different from screen to print. What you need to understand about printing and on screen view is that they are completely different mediums. Screens display colors according to transmitted light, and when you print something on paper with a printer, the color is displayed according to the absorption and reflection of light on the surface of your print. How you plan to use your print will determine what quality of printing you need, and what printing method is right for your project. This tutorial is geared more towards the creative consumer and DIYer to print projects at home with a home printer. So we will not be getting into the nitty gritty of RGB vs CMYK color profiles, or what have you. Most home printers will handle either color profile. Setting prints to CMYK is only necessary if high end printing is needed, and is not really necessary for the home printer. Before printing at home, look over your printer’s user manual to see what type of paper works best with your printer to achieve vivid colors, and what print settings are recommended for each paper type. Paper can make a big difference in how colors look when printed, so using the right paper is important. I recommend, for printing gift tags, to use 80 + lb bright white card stock paper, and for art prints, use white matte smooth archival paper, or a high quality matte photo paper. With framed art prints, you can also use fade resistant glass to help keep your prints from fading over time. Though, if you are not having the art prints printed with archival ink (which home printers do not use archival ink), also known as a Giclee print, your prints will not last even using archival paper and fade resistant glass. But, sometimes we don't need or want archival, we just want a nice print that will last for a little while. You can adjust the printer settings by going into your printer’s dialog box. 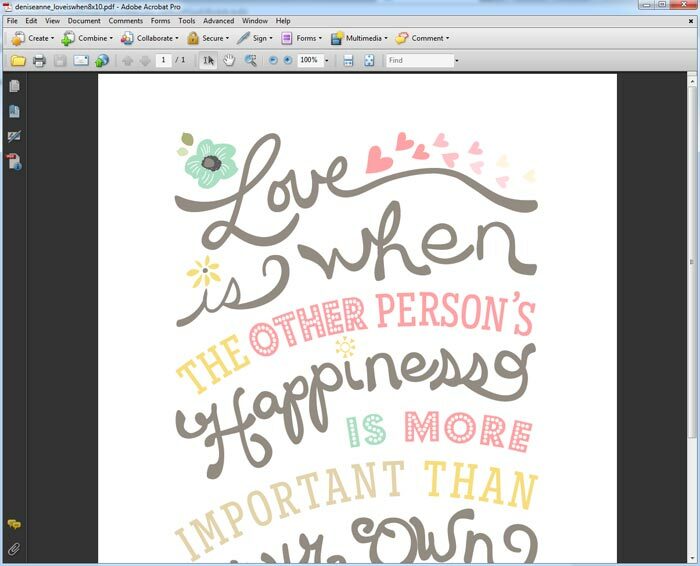 In the screen-shot below, I have one of my Art Prints opened in Adobe Acrobat Pro (you can also use Adobe Reader for free). I am ready to print this so I can hang it up in my office, and I am going to use my office HP Inkjet printer. You do not have to use an Inkjet printer. A Laser printer, my printer of choice, is also an option and may yield better results. But since most of us have Inkjets at home, I used the Inkjet for this post. I had some HP presentation paper in my office, so I am printing with this paper type for demonstration purposes. Note in this screen-shot of my printer dialog box, I selected the correct paper type, orientation, made sure the quality was set to “best”, clicked “ok”, and then hit print. Here is a photo of the finished print below. Notice the colors are bright and vivid. Now, I am going to print the same document again, using plain office paper, and the custom setting to print “best” quality. This is a photo of the two prints side-by-side. 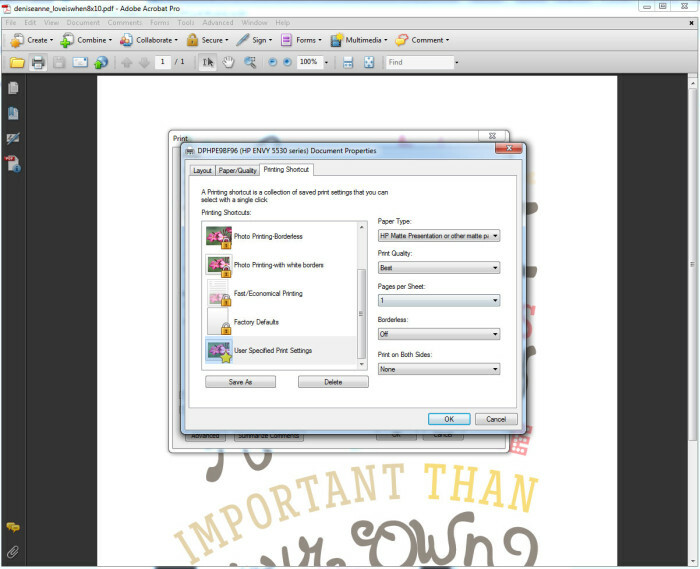 Notice the print on the left, using HP presentation paper, has greater color saturation and brightness than the print on the right using plain office paper. The office paper looks washed out and faded compared to the better quality presentation paper. This is because the paper itself is not as bright, and it is not formulated to handle as much ink. As you can see, your paper can make a huge difference in the look of your final print. Choosing the correct print settings and paper can give you beautiful results with your DIY projects. So, take my advice, and spend some time adjusting printer preferences, and buy the right paper for your intended use. This may take some trial and error with your printer and trying out different papers, but the end result will be in a finished project that has your desired look and colors.